After the busy sites of New York it was time to unwind in the Pennsylvanian countryside with out friends PJ and Michael (whom we met on the Alaskan cruise). 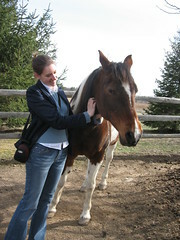 This is a picture of me with PJ’s horse Endless Love – she is very friendly. They have a beautiful log cabin in the Poconos, about 2 hours out of New York city, and this was the perfect cure for the hostel blues! It was a great time, chatting and catching up on what we had been up to since the cruise and comparing our cultural differences. Michael took us to a good ol’ fashioned American diner (chrome exterior and all) and PJ showed us the world of American outlet shopping. Needless to say we had some great food and we got some excellent bargains! In what has become a comical norm, Simon and I got hit with yet another record storm, 7inches of rain in one day a new record for New York! Gemma come home! We need the rain that’s following you. No need to hurry home, we are getting rain at the moment. I also noticed that the weather in the UK has also turned cloudy and rainy. It must have taken a few days to catch up to you Gem. I’m flattered that Luv made it into your blog, but the girls are jealous! Hope you’re continuing to have fun in London (my favorite city). Now that I’ve figured this out, I’ll be tracking your adventures. I know I know, we did not get a picture of them, on our next travels through New York we shall make a special effort. I hope this smoothes things over with them! Pleased to say that there were no mice in the luggage. Really enjoying London, and the walkie talkies have been extremely handy!